In early October three ICCE members travelled to Washington, DC to attend the Fall Board of Regents meeting for the US Chamber Foundation’s Institute for Organization Management. Institute is the premier nonprofit professional development program for association, chamber, and nonprofit professionals fostering individual growth through interactive learning and networking opportunities. ICCE Chair Lynn Olberding, Vice Chair Mike Hofman and Blain Andera, an ICCE board member, all serve on the Board of Regents for Winter Institute in Tucson, AZ, one of five sites for Institute. 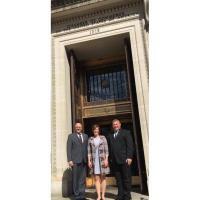 They spent three days at meetings providing guidance, making plans for the implementation of the program on site and connecting with other Regents and Board members from across the United States. An educational component was also included in the activities. Dr. Steven Swafford, IOM, ED.D. presented to the group on how we can design interactive learning experiences for attendees of our events. As graduates of the program all three are passionate about the value that it has provided to their professional lives. The connections to chambers large and small across the country are a tool that each of them use every day. Institute for Organization Management was designed to enhance individual performance, elevate professional standards, and recognize association, chamber of commerce, and other nonprofit professionals who demonstrate the knowledge essential to the practice of nonprofit management. To learn more about the program please contact Lynn, Mike or Blain or visit: http://institute.uschamber.com/ for more information!